Let's be real. You're probably not going to be sitting around thinking about holiday cookies and decide, "Hey, I want some goat cheese in my cookies." But, it is possible that you'll need a couple tablespoons of goat cheese for a recipe and then wonder what you should do with the rest of it. The answer is make these cookies! Or, if you happen to make those whipped goat cheese crostini with rosemary roasted pears and have some leftovers, then you can make the homemade pear jam too. Not necessary, but totally delicious. 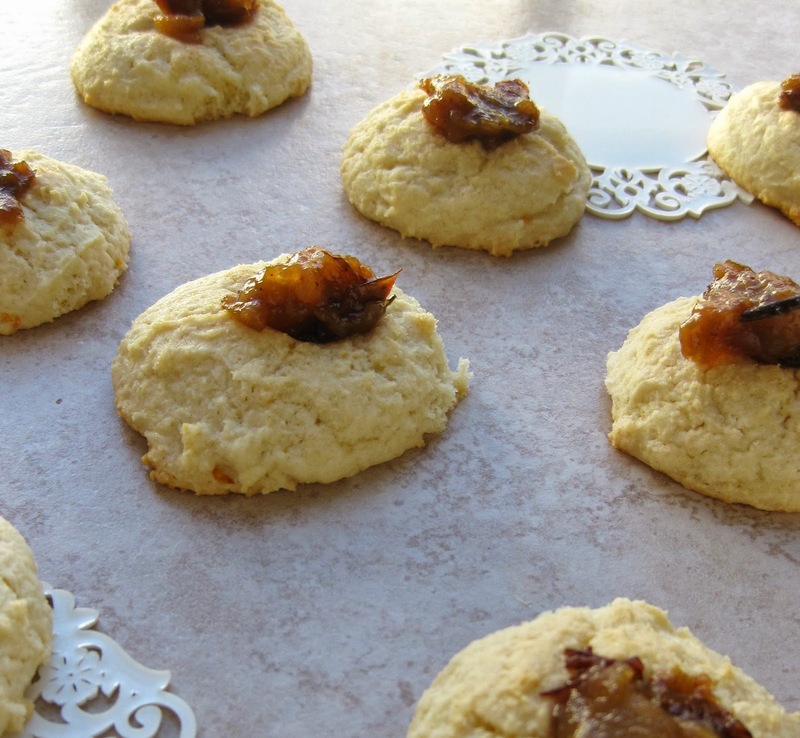 Essentially, the goat cheese replaces half of the butter in this cookie recipe. You don't exactly bite into one and think "Oh, that's goat cheese," but there is a noticeable difference. A slight tang. A more crumbly texture. However, I think these cookies are fun and unique, and, well, special. They'd be great to serve at a New Year's Eve party. Or to bring as a hostess gift. Or to make to calm yourself while deep cleaning your entire house, stress Christmas shopping, celebrating your entrance into your late twenties (what?) and reevaluating your major life decisions. Wishing you a very merry Christmas, friends! Use any kind of fancy fruit spread you like. Blueberry, blackberry, or raspberry would be fabulous! In a large bowl, beat together butter and sugar with an electric mixer until smooth. Add goat cheese, egg, orange zest, and vanilla and beat well. Gradually add in dry ingredients, beating until just combined. Use a tablespoon as a measure, form cookies into balls. Use the end of a wooden spoon to create a small indentation in each cookie. Bake for 14-16 minutes or until cookies are lightly browned on the edges. The indentation will have risen a little, so while the cookies are hot, gently use the spoon to increase the thumbprint. 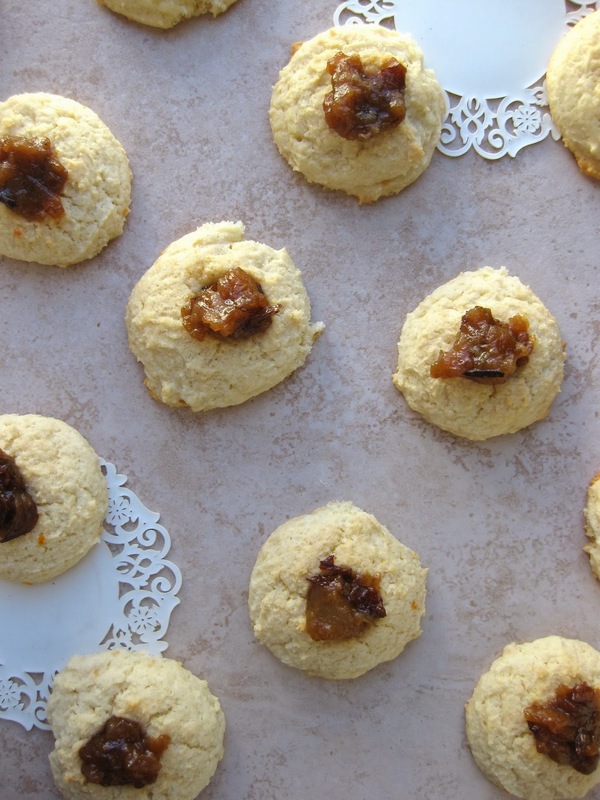 Once cookies have cooled for 10-15 minutes, fill with a dollop of your favorite jam. Cookies adapted from Buttercream Blondie. Combine pears, sugar, water, cinnamon and vanilla in a small sauce pan. Cook on low for one hour, stirring occasionally. In a small bowl, combine cornstarch and water. Add mixture to the pears. Continue cooking for another 10-15 minutes or until desired consistency. 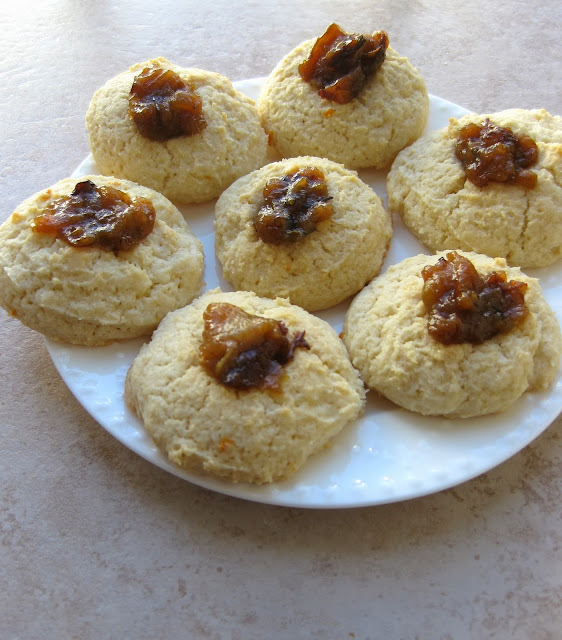 Goat cheese in cookies? What a genius idea! I'm a big fan of both cookies and goat cheese, so I'm sure I'd love these! Ohhh these look so different and I love the rosemary in the jam. I love herbs with baked goods/sweets. They look awesome, very festive, will be baking it soon. Haha…I know what you mean!